Kelly & Roche. Yikes..was it really 24 years ago? Somewhere over there back then I picked up a copy of the old French magazine Cyclisme International featuring this great photo in a race report called "Cocktail Irlandais." I rescued it from my basement flood damage back in April. "Sorry honey, any and all cycling memorabilia from '87 has to stay. No discussion." 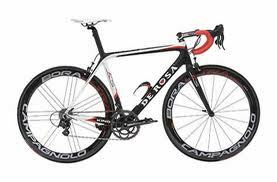 It was day that would be the hors d'oeuvre to a year that was the apex of Celtic cycling. '87 was the year Stephen Roche won Giro, Tour and Worlds. 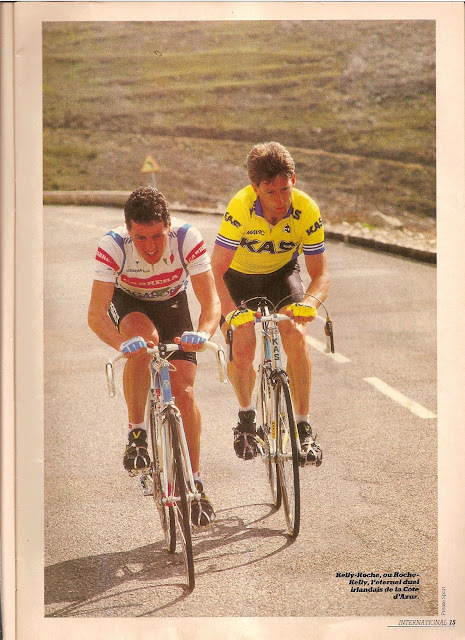 Sean Kelly took the Nissan Classic back home, and very likely would have won the Vuelta d'Espana if a saddle boil hadn't forced his abandon while in the leaders jersey. No worries though, he simply came back to win the Vuelta in '88. U2's Joshua Tree was on the top of the charts, and Kelly and Roche were 1 and 2 on the UCI rankings. It was a particularly good year to be Irish. Ah SKY, with you guys around, I'm always totally entertained. Today cyclingnews.com released an article where Bradley Wiggins has just ordained Edvald Boassen Hagen (cue trumpet fanfare) "the future of cycling™." 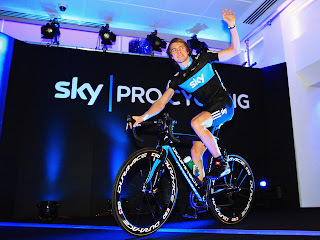 Hmmm....seems the SKY PR team is 'repositioning' their boy's brand for 2011. Now as most of us know, the prior 'unofficial' Boassen Hagen brand positioning was "the next Eddy Merckx™" (cue trombones). That positioning, while natural and attractive, is as risky as sailing toward the sirens call, the branding equivalent of swinging for the fence (last baseball metaphor I'll ever use, I promise). It's failed every time it's been deployed before. So quite smartly, those Anglo-aussie London-based masters of all things marketing have deftly shifted to 'the future of cycling'. I've heard they say at AA meetings, the first step toward recovery comes with the admission. So OK, I admit it. I'm a bit of a pack-rat when it comes to certain old pieces of cycling gear. Not so much with old bikes, to me they're a thing of beauty for sure, but primarily a tool to beat upon. But some pieces of gear establish a more personal connection. Why do we decide to keep the things we do? Who knows, this is a wielercafe, not a psychologist's office! All I know is that I can't bring myself to get rid of this helmet. This Rogelli Sport patent-leather hairnet saw a lot of action back in the eighties. I think I got it in 1982. Rogelli Sport was the helmet to have at the time, the approved war bonnet of Hinault, Raas, Saronni, Zoetemelk and what seemed like half the pro peloton in the early eighties. Hoi Flahutes! Busy day today, culminating with a huge annual family and friends open house Christmas Eve feast tonight at chez Eddy. My wife has as usual ensured they'll be lots to eat, and plenty of sweets to be mostly avoided. Zwaar karakter test, is Christmas for cyclists. Pity there won't be a Vlaamse Hutsepot - the preferred dish of Briek Schotte. It's basically a Flemish 'Hodgepodge' a meat stew of ham, bacon, pork, pig tail, eel. Goes nice with a dark Trappiste ale, or even better yet, a west flanders red sour ale like a Rodenbach. Brewery Ommegang from New York has a version call ZUUR. As my good friend Darren likes to say, the best vegetable to have with this dish is...more meat! Don't worry, there are some turnips, potatoes, leeks and onions. Check out the recipe here at the Centruum Ronde van Vlaanderen site. This is true stick to your ribs sustenance guranteed to get you through a 4 hour winter ride. Our good friend, fellow cafesupporter, and world's #1 Flandria fan Adam Longworth - the man behind the resurrection of Flandria Bikes - sent us news of last week's relaunch of his sweet 2011 range back in Zedelgem - the former home of the Flandria factory. Check out the article, and photos in Het Nieuwsblad here. The well attended event was held at the Zedelgem Flandria dealer De Fietsenmaker. Former Flandria stars Walter Godefroot, Michel Pollentier, Daniel Verplancke and Marcel Ongenae were on hand for this press event to share stories and celebrate all things Flandria, old and new. In addition to the new Flandria carbon frames (check em out here), a few retro rigs were brought out as well. This red bike at left with the bar-end shifters is Rik Van Looy's Paris Roubaix winning bike, from 1962. He likely also used it to win the Ronde and Gent-Wevelgem as well that spring, as he pulled of an imperial sweep of the cobbled spring classics befitting the 'Emperor'. Let the assault on 2011 begin! Hope you all are getting back to haardtrainen after your autumn layoff. Mine ended Thanksgiving weekend. Total net gain, a mere 4-5 pounds. Not too bad, considering I emptied a few bottles of Affligem and St. Bernadeus. OK, OK, maybe more than a few. Today it was out into the 35 degree cold. Snow is predicted for Sunday night. Need to try to get a few rides in before the white stuff, as well as fit in some Christmas shopping, my son's basketball game, and sporza-cyclocross viewing. Weekends are so programmed these days. As is training. I've been filling my brain with lots of winter training reading, and have decided to give Josh Horowitz advice a try. He's a pro coach who writes for Pez, and has posted some pretty sound and logical training articles about myths of winter training (here), and on building strength and power on the bike during winter training rides (here and here). The only two Dutchmen to win the Tour de France, Jan Janssen and Joop Zoetemelk, had a few things in common. First, they spend most of their careers in French teams, living in France. Jan for Pelforth beer and BIC; and Joop for Mercier and Gitane and LeJeune. Both were also Flandria teammates, in 1972. 1968 Tour Winner Janssen (left) was nearing the end of his career. He was brought into Flandria to help their rising star Joop Zoetemelk (right, 2nd in both the '70 and '71 Tours) eat the cannibal Merckx by putting him into a Dutch tactical sandwich. It was a big time for Dutch sport, the era of Johan Cryuff and Total Football. The Flandria folks in Zeldegem must haverubbed their hands envisioning similar, exciting 'totaal wielersport' from these two Dutch Masters. Today the 'cat' was let out of the bag by Jakob Fuglsang. The title sponsor for the Luxembourg cycling project? The Luxembourg Leopards. Name on the Jersey? Team Leopard. Possibly. Frank Schleck is saying it will be Team Lëtzebuerg. Team Manager Brian Nygaard is now saying it won't be Leopard as the name on the jersey. We'll know for sure in January. Don't laugh. The Leopard idea might be the future of professional cycling. Even, dare I say, its salvation. Professional sports franchises on the US team-sports model. Built upon regional loyalty to a defined city-state, funded by a local business magnate, and...named after an animal. The Boston Bruins. The Chicago Bears. The Atlanta Hawks. I think it's a pretty good model. At least as far as harvesting natural fan loyalty to build long term value and lasting brand equity in pro cycling teams. “We included in all of our riders’ contracts a penalty clause which demands the payment of five times their salary if they’re find guilty of using doping substances. Whoever wants to be part of this team must accept it, and all riders are considered equal: Russians, Italians, Spanish, French and ....Spanish." "Just remember the five D's of dodgeball: Dodge, Duck, Dip, Dive and... Dodge." Joaquim Agostinho. A soldier's story. I live right smack in the middle of a Portugese-American community. My wife is the proud granddaughter of hard-working Portugese emigrants, and I've been happily assimilated into a fantastic and very close Portugese family. Soccer (Futbol) is embedded into the local sports culture in these parts... you see Sporting Lisbon stickers on cars, and green-white hooped replica shirts on the faithful of all ages. A nice bonus is RTP International on cable TV. In August, just when post-Tour withdrawl syndrome is at it's maximum, I can detox gradually by recording daily multi-hour live stage coverage of the Volta a Portugal - a perfect antidote for Post-Tour-TV hangover. Portugal's national tour has some great classic climbs. The annual summit moutain stages finishes of Torre (Sierra Estrela) or the circular road up to the summit church at Santa Maria de Graca have had battles that sometimes rival the other national tours. What's better than cycling team jerseys? 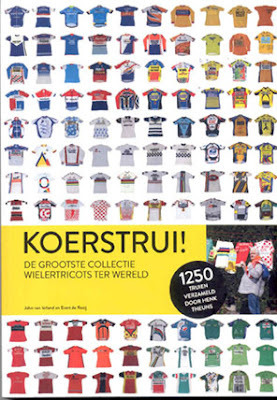 Jerseys - I would argue even more so than bikes - are the defining emblem of our sport. Part billboard, part primary visual rider-recognition device, part clothing, part style icon - the jerseys is the 'kit' element that tends to leave an indelible impressions on your brain. Jersey designs define eras, providing visceral recall of great races, champions and moments. They're our flags, our heraldry. 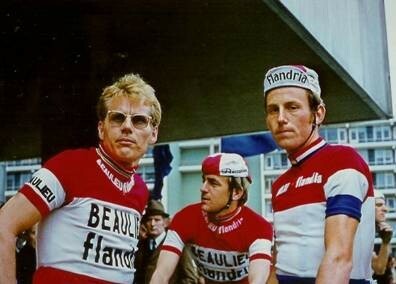 1977 Tour de France. The Alpe d'Huez stage, and a clash of titans. 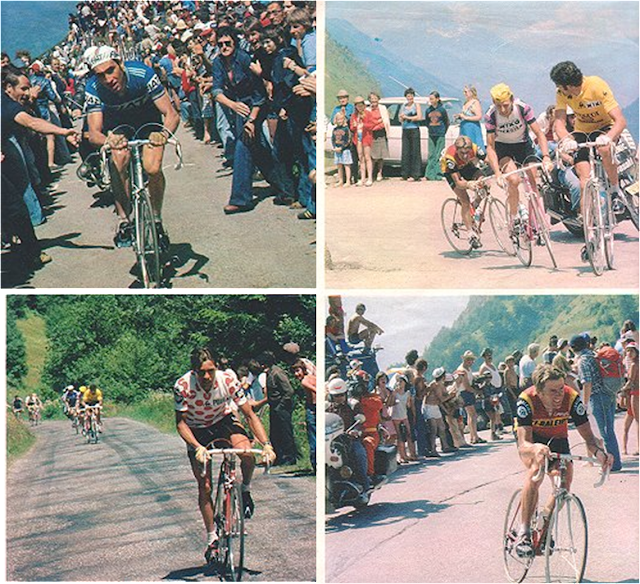 '75 Tour winner Bernard Thevenet was in Jaune, but '76 winner and best climber Lucien van Impe had made his bid for victory on the Col du Glandon, and was away and keeping a healthy gap up the finishing climb to Alpe d'Huez. It looked like two-for-two for the man from Impe-Mere. 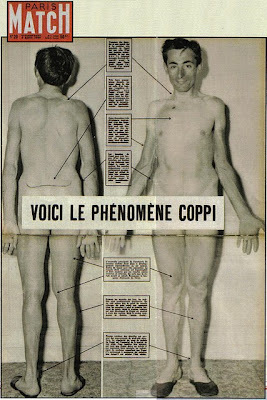 Behind him, a select group had already shelled the cannibal Eddy Merckx who was riding his final Tour. 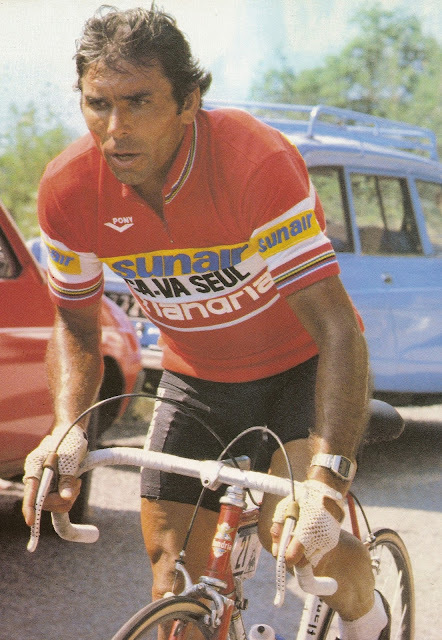 Thevenet was left with the two Dutch favorites - Hennie Kuiper and Joop Zoetemelk - glued to his wheel, and not taking any pulls. "Your jersey, your responsbility meneer." Professionally appropriate tactics that didn't set too well with Thevenet, who gamefully led the chase behind Van Impe. Hands on the tops, grinding a giant gear around with all the effort of his rocking shoulders. 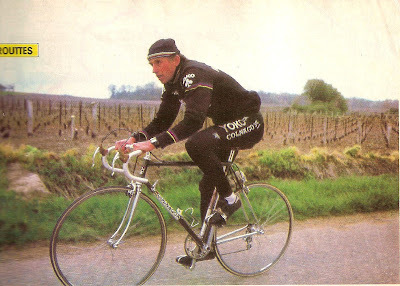 With Thevenet, cycling was a full body effort.